(Nanowerk News) New images of iron-based superconductors are providing telltale clues to the origin of superconductivity in a class of ceramic materials known as pnictides. The images reveal that electrons responsible for the superconducting currents in some pnictides tend to flow primarily along the boundaries between the crystal grains that make up the superconductors. The research, which is reported in a pair of papers appearing in the current issue of the journal Physical Review B, may help physicists to find new superconducting compounds that can carry current without the electrical resistance that plagues conventional metal conductors. 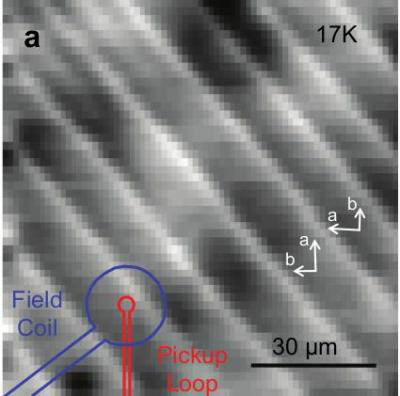 A probe measuring the penetration depth of a magnetic field into a high-temperature superconductor reveals stripes that hint at a connection between crystal boundaries and superconductor quality.